The weather is really throwing me for a loop. My calendar says fall, my cravings say fall, but the thermometer is reading in the high 70s and I really want to pull out my boots and blanket scarves. We took Jane apple picking this weekend and while we sweated our way through the experience, I left with a big craving for autumn flavors. That is exactly where the inspiration for this recipe came from, an apple cider roasted chicken served over wild rice and asparagus. Whenever a whole cut up chicken goes on sale at our grocery store I try to plan a meal around it because it’s super cost-efficient and makes a ton of flavorful leftovers that I use for lunches. This time around, I wanted to give the chicken tons of autumnal flavors. 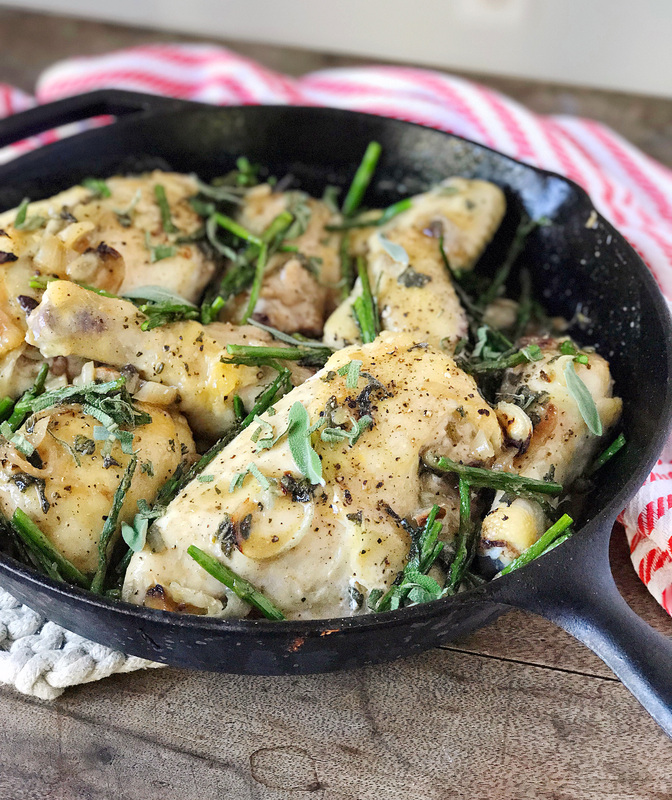 I roasted the chicken in a cast iron skillet with shallots, sage, and just a touch of wine. Once the chicken was just about cooked through, I removed the pieces from the pan and put it on the stovetop to make a pan-sauce. The sauce grabbed all of the good bits at the bottom of the pan as I added in some mustards and apple cider. I served this dish with roasted asparagus, tossed in with the same sauce because it was so tasty, and plated it all over wild rice. Coat chicken with a light drizzle of olive oil and season with salt and pepper. 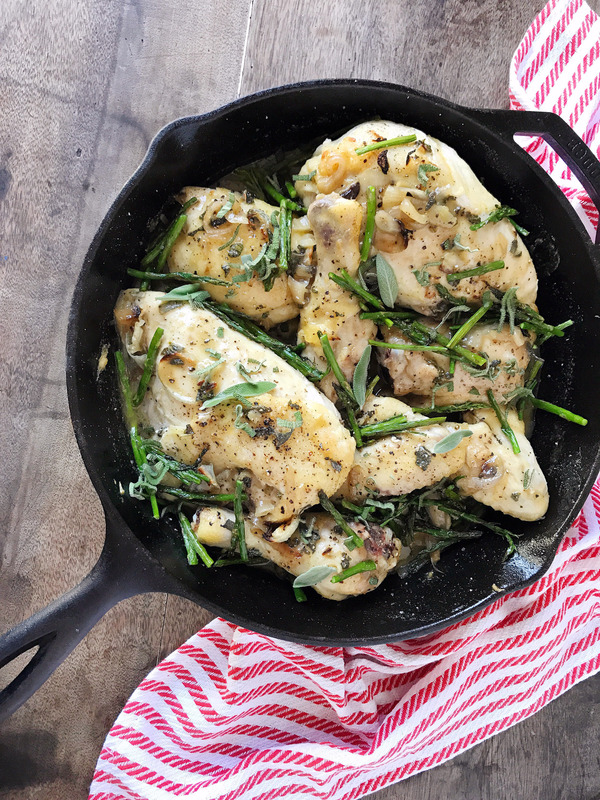 Add chicken to a cast iron skillet, sprinkle with sliced shallots and sage, and pour white wine into the pan. Roast at 425 degrees for about 40 minutes until the chicken pieces reach an internal temperature of 165 degrees. Some pieces may cook faster than others; remove any pieces from the pan as they reach their target temperature. Remove the skillet from the oven and place the chicken pieces on a plate, set aside. Heat the cast iron skillet and remaining drippings over medium heat on the stovetop. Add in brown sugar, mustards, apple cider, and cornstarch. Whisk together until fully combined and reduce until the sauce thickens. Add chicken pieces back into pan and spoon sauce to coat the pieces. Serve with roasted asparagus and wild rice. Apple Picking. Coffee Cake Donuts and National Coffee Day.